Meg's Food! 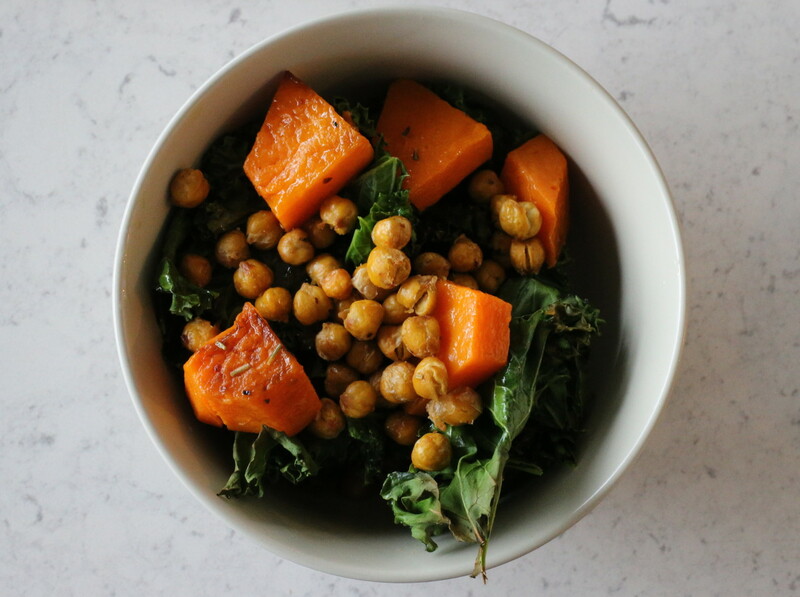 | Crispy Kale and Squash Bowl - Meg's Food! I’m still all about the 2016 bowl trend. What’s not to love – they’re easy to assemble, packed with veggies, and it’s so easy to flavour them in different and interesting ways! This one starts with crispy kale. Usually massaged kale is my go-to, but since it’s cold and windy out, I wanted something warmer. 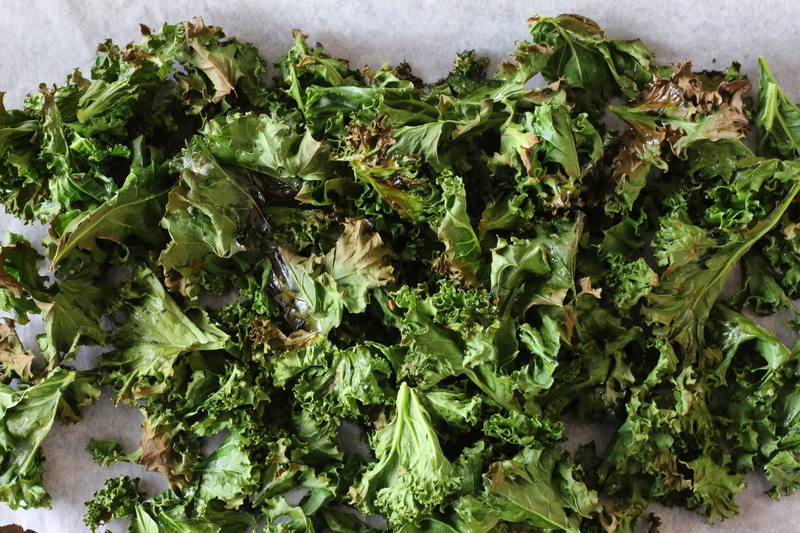 Kale crisps in the oven in less than 10 minutes – so. easy. Then top with roasted butternut squash because obviously. Add some roasted chickpeas and a zippy ginger dressing, and you’ve got yourself a tasty lunch! Preheat your oven to 375 and line 2 baking sheets with parchment paper. Start with the squash. Peel squash, remove seeds, and cut into cubes. Place on one of the baking sheets. Drizzle with olive oil, season with salt and pepper and chili flakes. Dry chickpeas between layers of paper towel and pour onto the second baking sheet. Drizzle with olive oil and sprinkle with salt, pepper, and chili flakes. Roast squash and chickpeas until squash is tender and chickpeas are crispy – about 30 minutes for the squash, 40 for the chickpeas, tossing every 15 minutes or so. Next, roast your kale. Remove stems and rinse. Toss with a drizzle of olive oil, and sprinkle with sea salt, pepper, and crushed chili flakes. Roast until crispy, about 6-8 minutes, tossing frequently. To make dressing, whisk all ingredients together. 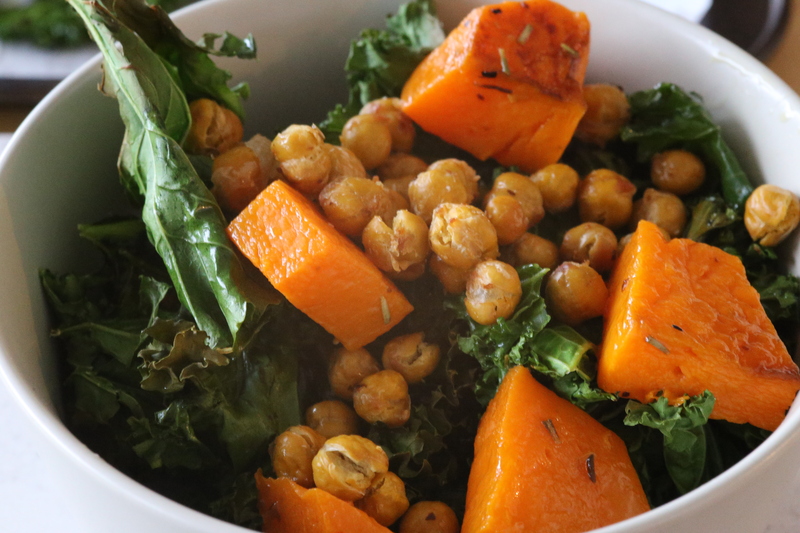 Pile kale into bowls and top with squash and chickpeas. Drizzle with dressing. This entry was posted in Dinner, Lunch and tagged bowl, butternut, ginger, roasted chickpeas, squash, vegan. Bookmark the permalink.